The NGO Syrian Observatory for Human Rights (SOHR) obtained the video, allegedly from one of the individuals present at the desecration of her corpse. SOHR reported that Kobane reportedly died fighting in Bulbul, in the northern Afrin region, where the FSA has launched attacks against the YPJ and the Kurdish all-male YPG unit at the urging of the Turkish government. While President Barack Obama led the effort to arm the FSA, he received bipartisan support for the effort. Senator John McCain, in particular, supported the group, taking photos with group leaders. The Trump administration has chosen to distance itself not from the FSA, but the YPJ. 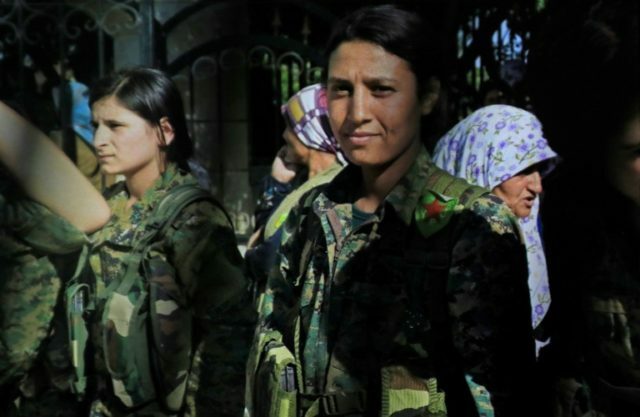 The YPJ is one of many militias forming the U.S.-backed Syrian Defense Forces (SDF). Speaking to reporters, Pentagon spokesperson Eric Pahon said Tuesday that support for the SDF does not necessarily mean support for the Syrian Kurds. “You are talking about the YPG and the SDF as an umbrella unit but it is not that simple. … They are a federation fighting under one command and one cause. If pieces of that fracture [and] move out, we are not cutting our support for the SDF as a whole, it will be those individual pieces,” he told Turkish newspaper Hurriyet. “We cooperate with those units that are working to defeat ISIS. The units that have moved out or moved to Afrin are not US-supported units,” he added.